It’s almost like a bonus – 3 blocks this month! And it’s lucky number 7, so let’s get right to it – block #7 in the MooglyCAL2017! Above is the original, made in 5 colors. Below, you can see my version, made with 6 colors! This pattern is free – go to http://stitchesnscraps.com/free-pattern-beach-ball-square/ for the pattern – to print or download for free, open a new tab to PrintFriendly.com and enter the pattern URL there. 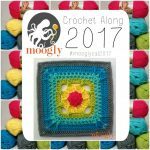 This pattern is easy and fun to crochet, but be sure to take your time making little bobbins, or rolls of yarn for the different parts of the beach ball – and untangle them as you go! I did come up just the tiniest bit short (which is very normal for me), so I bumped up Round 17 to hdc instead of sc, and that got me right to 12″. Everyone is different so be sure to measure as you go! Learn how to adjust for size HERE to make sure all your squares are the same size. Remember that the 12″ is measured across and up and down – not diagonally corner to corner. 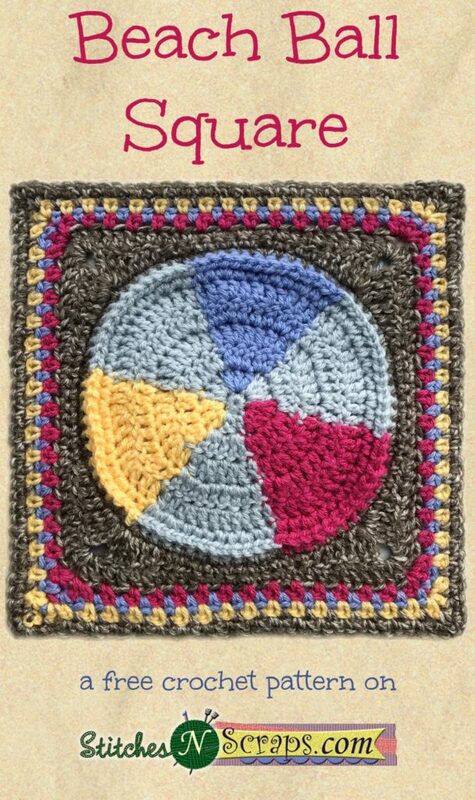 Techniques you can use with this square if you’d like, and tutorials you might find helpful: Magic Circle; Keeping a Magic Circle Closed; Switching Colors; Moss Stitch; Standing Single Crochet; Standing Double Crochet; Chainless Starting Double Crochet; Seamless Join. I used a Furls Odyssey hook and Lion Brand Vanna’s Choice, and my color scheme was as follows – For Rnds 1-Ball Edging: Color A: Silver Grey, Color B: Rose Shocking, Color C: Aqua; Rnd 9-11 (Background): Aquamarine; Rnd 12: Radiant Lime; Rnd 13: Aquamarine; Rnd 14: Radiant Lime; Rnd 15 and 16: Aquamarine; Rnd 17: Silver Grey. 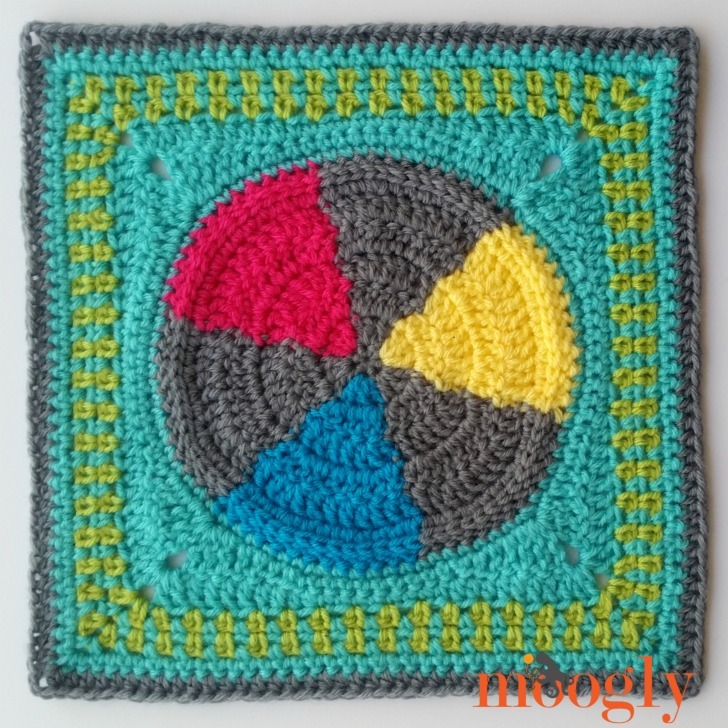 To block this post, I used the wet blocking method and a Chetnanigans BlocksAll Ultra blocking board – CLICK HERE to learn how to block your squares! 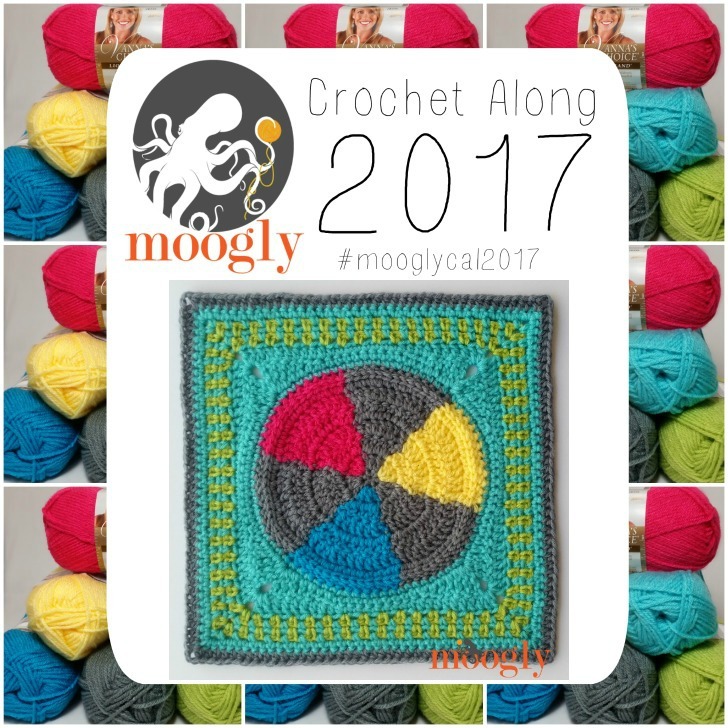 Thanks so much for crocheting along with me! 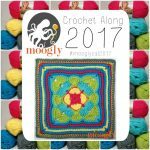 I can’t wait to see all the beautiful blankets you crochet this year! 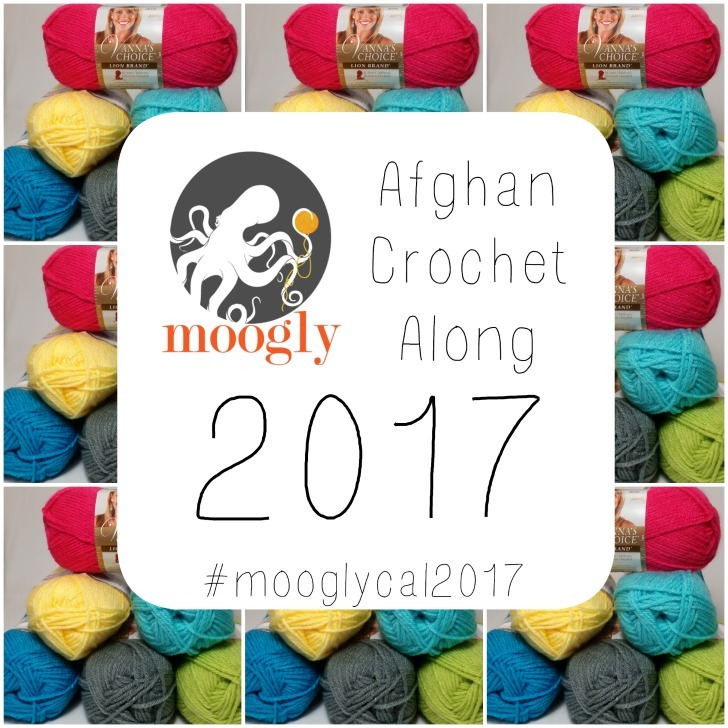 Get Moogly on your favorite social media sites: Facebook, Twitter, G+, Pinterest, Instagram and Tumblr! Thank you to Lion Brand Yarn for providing the yarn for this Crochet Along. I think the link to the pattern is broken? It’s got some random characters after the URL and takes me to a ‘page not found’ page. Yep, works perfectly now! Thank you! Ditto the first reply. 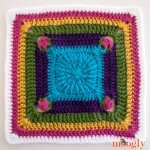 I get a page not found message on the link to this weeks’ beachball square pattern.. Your video on changing colors in a row. It was very helpful. But how do I initially attach the different colors so that I can switch off and on throughout the rows? Am I missing something? Are you saying at some point cut the yarn? Do I crochet over ends? What happens when turning? I have a hard time reading patterns… are there any video tutorials on this years cal blocks? Can you give me the alternate patterns link? I want to print this pattern, but the page will not load. Is there another website to get this pattern from? Hi Alison! Stitches N Scraps is the owner, so you’d need to get it from her site. Does this link work: http://stitchesnscraps.com/free-pattern-beach-ball-square/ You may need to refresh the page if it’s stuck in your cache.